Let me tell you three things about the Sacred Heart. First, I never understood it. As a kid I was creeped out by kitschy pictures of Jesus pointing to his bleeding, dripping heart. I shuddered and skittered away past looming statues in church basements as quick as I could. I stole only the quickest glance at Christ, standing alone, clutching his heart pierced with thorns. Neatly filed away under “not my spirituality” in my Catholic Devotionals collection. Second, I found myself inside it. After Abby and Maggie died, we found ourselves inside the heart of God in a mysterious and moving way that still unsettles me every time I think about it. What was that? What are we supposed to do with that? As I’ve been starting to write their story, I did what any author worth her salt should do: go back to the sources, collect all the evidence, do my due diligence. Here is the surprising truth I uncovered. Whenever my husband and I would remember the story, it would go like this: Maggie died in our arms; our hearts were broken. Then we held Abby; our hearts were full of joy. That was the moment when we were right inside the heart of God. Upon careful review of the evidence closest to the incident, I discovered that I texted one of my closest friends after we got back to the hospital room on the night that Maggie died. I wrote to her that we were right inside the Sacred Heart of Jesus. Where everything is broken and bleeding and wounded, but somehow there is still purest love. I have no memory of writing those words in the blur of rawest grief. I thought we only understood this truth the next day as we held Abby. But the proof is in the text. Somehow we recognized we were inside the Sacred Heart as soon as everything was a broken, bleeding mess. Before we ever felt joy or tasted heaven. Somehow we knew it was holy even in the hardest moments. So when the next day dawned, and we wept together, and we thought for sure that the shreds of what was left of our hope would burn to ashes – as we went back to that daunting NICU, as we took another child off life support, as we held another dying baby in our arms? The unexpected happened. Again. That abundance of joy sealed right around the suffering wounds and let us bask in the fullness of love. Which cannot be filed neatly away. For it defies categories: Sorrow AND Joy, Death AND Resurrection, Good Friday AND Easter Sunday. Third, I see it everywhere now. I’ll admit my eyes are stretched open wider to see what I did not notice before. But the Sacred Heart is everywhere. How did I miss it? 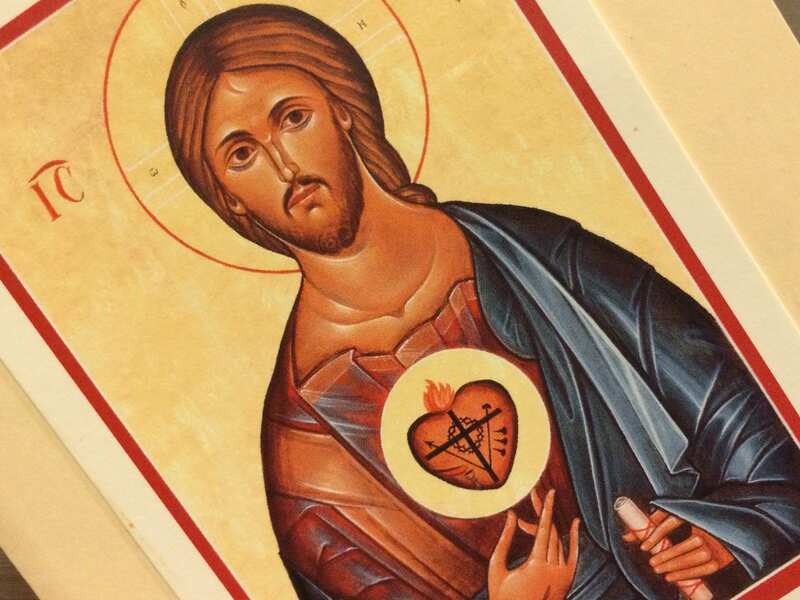 I don’t just mean the uncanny cards and prayers that mysteriously keep showing up in our mailbox, picture after picture of the Sacred Heart from strangers and friends. I mean something deeper. That the woundedness of God’s love is everywhere I look. It is the beating pulse behind every heart-breaking story of death and destruction in the news. It is the quiet love behind every tiny tragedy that never makes the headlines. It is the steady hope that meets me whenever I want to despair of this hard life. I have carried a pulsing, powerful image with me every day since our daughters died. It is the broken, bleeding heart sealed right around with mercy. It is everything I understand about God now. It is undoing and remaking my life. I hope that someday it might do the same to yours. On today’s Solemnity of the Sacred Heart, I’m reflecting at Blessed Is She. If you aren’t already receiving their free daily devotionals in your inbox every morning, click here to sign up today. I have to tell you–our chapel has 4 or 5 different cards, all beautiful in their own way. Obviously my “random” choice of a card was not random in the least. But your description of the top reminded me of my 12-year-old neighbor’s comment that she doesn’t like sitting where she can see the Sacred Heart picture on the wall in our church. As you did as a child, she finds it disturbing. Prayers continue for you and yours. May God hold you close and bring you comfort. So beautiful! Read this through BIS email. No words, thank you. I’m so glad that you have shared your amazing journey on Blessed is She. I don’t wish grief on anyone, but I can personally attest to the blessings that accompany it. I have kept a gratitude journal for years, and my longest entries have been during times of grief (losing my twins 9 years ago, and losing my father four weeks ago). I never thought of it as pure love residing in the brokenness, but it makes sense.